I am usually very clear that I hate 3D movies and usually refuse to see them, but I guess I will have to make an exception for the upcoming Argento Flick; Dracula 3D. 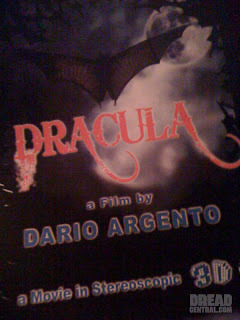 Argento’s re-imagining of Stokers Dracula could prove to be quite the amazing little movie. Rutger Hauer is set to play Van Helsing the famous Vampire Hunter. Argento + Hauer = Greatness? Only time will tell. I am definitely a huge Argento fan, owning most of all of his movies, and who isn’t a fan of such movies as The Hitcher & Blade Runner featuring Hauer? The film is set to begin filming in May in Budapest, Hungary. Will this be on your list of movies to watch?